British geographer, born 03/12/1742, near Chudleigh in Devonshire. His father, an Artillery officer, was killed in action shortly after the birth of his son. 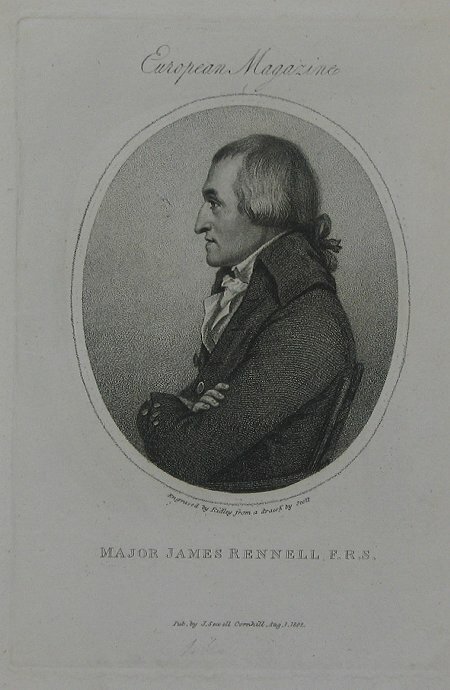 Rennell entered the navy in 1756 with the rank of midshipman, and was present at the attack on Cherbourg , and the disastrous action of St Cast in the same year. At the conclusion of the Seven Years War, seeing no chance of promotion in the navy in peacetime, he entered the service of the East India Company, and was appointed Surveyor of the Company's dominions in Bengal in 1764, with the rank of captain in the Bengal Engineers. To this work he devoted the next thirteen years. In 1766 he received a severe wound in an encounter with Indian religious fanatics from which he never fully recovered. In 1777 he retired as Major on a pension of £600 a year. The remaining fifty-three years of his life were spent in London, devoted primarily to geographical researches among the materials in the East India House. His most influential and important works include the Bengal Atlas , the first approximately correct map of India , the Geographical System of Herodotus , and the Comparative Geography of Western Asia . He also produced important studies on the geography of northern Africa in introductions to the Travels of Mungo Park and Hornemann, aswell as valuable research on the currents of the Atlantic and Indian Oceans. He contributed papers to Archaeologia on the site of Babylon, the island of St Paul's shipwreck, and the landing-place of Caesar in Britain. He was elected F.R.S. in 1781. He received the Copley medal of the Royal Society in 1791, and the gold medal of the Royal Society of Literature in 1825. In 1772, whilst still in India, he had married Jane Thackeray, great-aunt of the novelist William Makepeace Thackeray. He died on the 29/03/1830, and is buried in the nave of Westminster Abbey.